Are you ready for a simple-to-use professional quality sharpener for all your knives and scissors? We thought so. 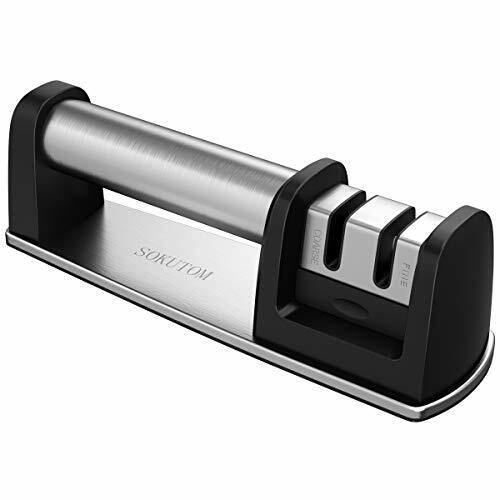 That is why we here at SOKUTOM have taken the extra care in developing the perfect answer to your dull blade issues.This device sharpens your knives in a few seconds. Keep yourself and your family safe by using only sharp knives, not dull knives. The item's small size is ideal for storing in your knife drawer and for anyone with a small kitchen or little storage space. SAFETY AND FUNCTION: 1.Our non-slip base and ergonomic handle makes sharpening easier and safer than with competitors' models. 2.This method sharpens your knives in seconds. Who has time to use old fashioned stones and rods? 3.Keep yourself and family safe by using only sharp knives. Dull knives are dangerous! 4.Cutting with a dull knife means you have to use extra force. A slip of the knife can lead to serious accidents. Sharp knives are safer, though this may seem counter-intuitive. 5.Professional chefs always keep their knives sharp! How to use: 1. Place the knife sharpener on a flat surface. 2. Hold the knife sharpener by the stainless steel rod. 3. For a dull knife, hold the knife by the handle and pull it along the coarse slot toward you many times depending on how dull the knife is. 4. Move the knife to the fine slot and pull it toward you until it is as sharp as desired. It can take from 4 to 55 pulls depending on each knife. 5. Wipe the sharpener with a dry cloth to clean it up.